In order to provide prospective students with the best chance at having a great education, we have compiled this list of the top universities and colleges in New Mexico. Some schools may excel at online programs while others may focus exclusively on the traditional, on-campus aspect of higher education. Regardless of the delivery format, these schools excel at providing a quality education for their students. Although relatively new to the field of online and distance degrees, online colleges in New Mexico are born from the strongest of academic success and are only getting better every day. To help you find the right fit for your needs, we have put together this list of the best colleges in New Mexico. Each school earned a spot on this list due to its exceptional quality, academic excellence and devotion to non-traditional learning. And we know that one of them can be perfect for you and your new degree. 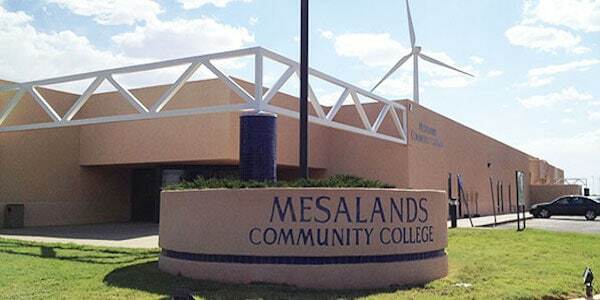 Mesalands Community College‘s goals are to encourage learning and provide accessible, multi-faceted services, academic and technical programs, and opportunities for personal growth through leadership and social responsibility. Mesalands’ online learning provide students you need a flexible schedule with the same quality education that on-campus students receive. New Mexico State University – Dona Ana enrolls over 14,000 students and offers 39 degree programs and 14 certificate programs. A wide variety of degrees are offered 100% online by well-respected educators that are experts in the fields they teach. The courses are designed to prepare students to enter the workforce and continue their education. New Mexico State University is a comprehensive university all about discovery. They enroll over 15,000 students and are classified as a Hispanic-serving institution. NMSU offers 100% online bachelor and graduate degrees for students unable to pursue an education through traditional means. Online courses are available every semester thought web-based technologies, interactive television, and faculty exchanges. Navajo Technical University was founded in 1979 to help all tribes moving toward self-determination by expressing their sovereignty and establishing their own institutions of higher education. Navajo’s online courses hope to remove time and place so students can have the flexibility to juggle their personal, professional, and academic obligations. The University of New Mexico was founded in 1889 and is called New Mexico’s “Flagship Institution.” Over 20 of UNM’s programs are offered fully online, and more are partially online. About 40% of students take at least one online course for convenience and flexibility due to busy schedules and prior commitments. New Mexico Institute of Mining and Technology is the #1 four-year university in New Mexico and was voted #9 out of 1000 schools in the nation for Return on your College Investment. the distance education program provides live, interactive courses that allow students to earn an education who need the flexibility or are unable to attend classes on campus. Eastern New Mexico University Ruidoso Campus is a branch off of Eastern New Mexico University after a family donated their hardware store as a building for education. From the very beginning, ENMU Ruidoso students are set up for success with online courses designed by professionals that are unique to the subject matter. New Mexico Junior College was founded in 1966 and offers associate degrees in science, applied science, and arts, as well as many certificate degrees. Online programs are offered to students who may be unable to attend campus, or who are in need of a flexible schedule. The college’s distance learning population includes high school students, on-campus students, and working professionals. Eastern New Mexico University is New Mexico’s largest, comprehensive institution in the region, and enrolls over 6,000 students at its main campus. It has a 17:1 student-to-faculty ratio and has over 60 different degree programs to choose from, all with a 95% satisfaction rate. Degrees can be offered completely online and are available 24 hours a day, 7 days a week. However, some courses require students to be online at a specific time. Santa Fe Community College is a military friendly school that seeks to empower students and strengthen the community. It was established in 1983. Online courses are convenient and informative given by experts from the comfort of the home. Course fees start at just $99. National American University in Albuquerque has campuses all over the United States. Over 100 degree programs are offered online from diplomas to masters degrees. The idea is to help students improve their skills and enter the workforce quickly. NAU also has an advanced option that allows dedicated students to complete their bachelor degree in 12 to 18 months. San Juan College is one of the largest two-year colleges with 15,000 students enrolled annually. San Juan was founded in 1956 and has been empowering students to thrive in the world ever since. Eight online degrees or certificates are offered on Canvas, and all online courses are being constantly evaluated to provide the best quality education possible. Clovis Community College originally started as a branch off of Eastern New Mexico University in a high school, and it now has its own campus. CCC believes in pursuing wellness, civic engagement, and leadership opportunities. CCC offers eight online, two-year programs that are designed to make education convenient and accessible. The Institute of American Indian Arts is the only school like it in the world. It is dedicated to contemporary Native American art and is one of three congressionally-chartered schools in the country. IAIA offers a handful of online programs and there is even a 25% tuition reduction for students taking courses online. New Mexico Highlands University is a state-run institution in Las Vegas. Highland seeks to achieve academic success, technological advancement, and a vibrant campus life. NMHU offers five online programs, three of which are Master of Arts in Education. Northern New Mexico College is the most affordable four-year college in New Mexico and offers bachelor degrees, associate degrees, and certificates. Northern is also unique in that it allows undergraduates to do research. Online courses use the learning management center called Blackboard, and all requirements and tuition of regular classes apply to distance learning. Western New Mexico University has been transforming the future since 1893. It offers more than 70 fields of study to its 3,500 students and they offer 9 fully online bachelor and master degrees. Online programs provide flexibility as well as eliminate transportation and childcare costs. Online courses require discussions, posted assignments, and peer review. Central New Mexico Community College was established in 1965 with 150 students, and now it enrolls 28,000 students in all of its locations. All online courses are taught by the same faculty and hold the same educational standards as the traditional classroom. CNM offers both online and hybrid classes, and students will be offered online academic coaching and Blackboard tutorials to ease students into online learning. New Mexico State University – Alamogordo has online programs that are high-quality and engaging. They are designed specifically for military, stay-at-home parents, rotating shift workers, full-time workers, and international students. NMSUA offers 9 online programs, as well as all online resources, students will need to complete them. Southwestern Indian Polytechnic Institute was established in 1960 by the All Indian Pueblo Council. The institution provides Native American students as life-long learners through partnerships with tribes, employers, and other organizations. Online students will use Zoom for a two-way video conferencing and Brightspace as a learning management system to receive a quality education equal to on-campus courses. New Mexico State University – Grants was founded in 1968 and enroll nearly 1,000 students. The online programs are 100% online with small classes so students can receive the attention and support they need. An extensive online library is available as well as 14 online degrees and lower tuition costs. New Mexico State University Carlsbad is a two-year branch community college of NewMexico State University. NMSU Carlsbad offers a wide variety of associate degrees and certificates in almost every field imaginable. The online instructional program for online and hybrid classes is Canvas, and training for the program is available. The University of the Southwest was established in 1962 in Hobbs, New Mexico. Although technically a non-denominational institution, WSW adheres to the belief in God and Jesus Christ. The online programs and courses offered at Southwest are perfect for students who like to sit at the back of the class and rarely speak up. Written communication is key, and the online programs follow in-class curriculum exactly. *This list was ranked by giving each school a score. Two-thirds of the score was made up of each school’s graduation rate, with the remaining percentage made up of the tuition cost. For more detail about our ranking process, please visit our methodology page.